There is an old saying “You always hurt the one you love.” Well, if that is true Anthony and Megan Cascio had nothing but love for each other growing up, as most brothers and sisters do. Both are racers popular on the track and in the pits. The Cascio family can be called a MX family. They even have a school for riders for those of you new to the sport or those of you wanting to lower your track times, jump that double, or tighten your turning, look for their trailer or I personally suggest you talk to them at the track, you will find they are fun, friendly, and helpful. Anthony has been singled out as a Motocross Hooligan, a group that is growing in numbers throughout the MX community. Megan is also a part of a group; she is one of many girls now making their impact on MX. I recently talked Ese’ into letting me have a go an interview with these two. Anthony Cascio: Hello Cascio residence, Anthony speaking. 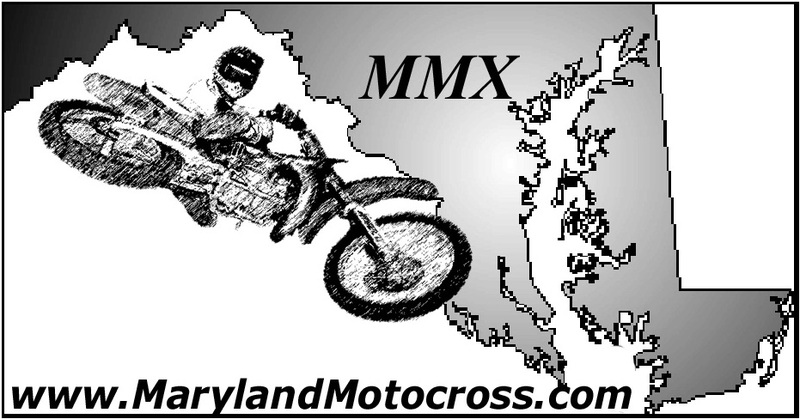 MarylandMotocross.com: Hello Anthony this is Vance from Marylandmotocross.com, can I get a couple minutes from you and your sister? AC: Umm, can you hold on for a sec? AC: (Amused) Sorry my sister is not here, she’s shopping with my mom. AC: That would be fine. Ese’: He-he. Looks like Girls rule SHOPPING too. Kevin: I know something funny. (Kevin hits Ese’ with frying pan): Blick-up! Ese’: OOOOWWW! That hurts more that last time. (Kevin holds up new frying pan): He-he, Teflon coating. 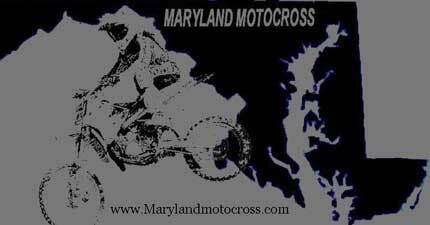 MM.com: Hi it’s Vance from Maryland Motocross. Mrs. Cascio: Hi, how are you? MM.com: Good, I’m here to get dirt on your children. Mrs. Cascio: (Laugh) okay, hold on for a second. MM.com: Okay guys, quick and painless. How old are you guys and how long have you been riding? Anthony first. 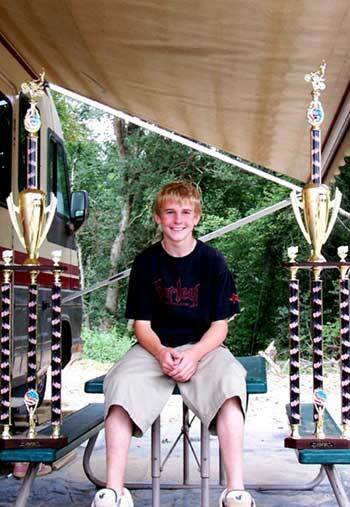 Anthony Cascio: I am 15 and I’ve been riding for 11 years and racing for 10. 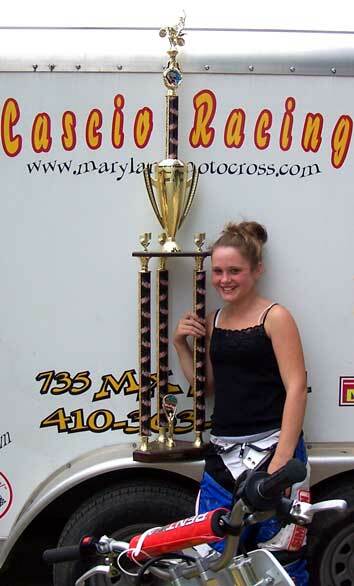 Megan Cascio: 13 years old and I’ve been riding for about 5 years. MM.com: So what kind of bikes and gear do you guys use? Megan? MC: RM 85 and a RM 100 and GSA. AC: a RMZ 250 4-stroke and Thor. MM.com: Whom do your parents love more? AC: (Confused) Whom do our parents love more? MM.com: Yeah either of you can answer. MC: (Giggling) Um, my dad loves me more and my mom loves Anthony more. MM.com: Do you agree with that Anthony? *Note: This was a joke question. Ese’ wrote this question and he sometimes has a non-PC, twisted, and albeit loony sense of humor and the Cascios love their kids the same and are driven crazy by them the same. See… another joke. AC: Mainly we concentrate on things like turns. We try to find out what kind of caliber the rider is. So that we don’t push them and we know how far we can push them. Jumps and starts are also a focus. MM.com: Megan, so how come you’re not a part of girls rule racing? MC: I’ve never been asked, and… I dunno. MM.com: If you were given the opportunity to, would you be a part of it? MM.com: Favorite track or events? AC: Probably either Waldo or Virginia Motor Sports. Events…It’s gotta be the MAMA Nationals. MC: Favorite track is Bud’s Creek and MAMA Nationals. MM.com: How do you two get along off the track? Either of you can answer. AC: (Laughing) Oh, we don’t get along at all. AC: (Amused) No. We don’t. MM.com: Okay then. Megan doesn’t know what a Motocross Hooligan is and Anthony has been described as one, either of you have any comments on that? AC: Umm… not really no. MM.com: Did you guys find out what one was? AC: Dough Henry for me. MM.com: Did you say Rash-a-shana? MM.com: Anthony, how did you manage to stay clean at The Landing MX Mud War? AC: (Amused) I…just…went over to where everyone wasn’t battling and had my fun just watching them. MM.com: So you saw what was going on and decided to get out of there? MM.com: Megan were you annoyed that Anthony wasn’t even dirty? MM.com: Anything either of you like of dislike about MX? Megan. MC: I like having fun out there riding with my friends and knowing when to ride hard and when not to. AC: I like everything about motocross except for dirty riders. I don’t like to see or fall victim to people doing things deliberately to hurt someone or take some one out. Cocky people can also get annoying. MM.com: Anthony name one word that describes your sister. AC: in my dad’s view or my view? AC: Reliable. She’s an okay sister. She’s there for when I need her. MM.com: What hobbies do you guys have off the track? MC: Talking on the internet and watching at the track. AC: Coming home after school and going to sleep. MM.com: I agree with that. Sleeping is a great way to pass the time. MM.com: What is the meanest thing the other sibling has done to you? AC: Umm…probably when she bit me. MM.com: She BIT you? Was this last week or a while ago? AC: That was a long time ago. As of late…just being a girl with an attitude. MM.com: Megan your turn to dish some dirt on Anthony. MC: We used to get into big fights and Anthony punched me really hard. MM.com: Sounds like brother and sister. Anthony is there a deal with the trademark cross on your helmet? AC: Yeah. One cross is for Ron Streebee who was a close friend of mine and died in a car accident and the other cross is for Howard Jones who had a heart attack on the track. MM.com: I see. Megan, why are you and Danielle Greig always causing trouble? MC: I really don’t know. We just like to have fun and get in trouble I suppose. MM.com: What are the names of the two dogs you guys always take to the track? MM.com: Well, that pretty much covers it, thank you guys for your time and I’ll see you guys on the track. AC: All right. See ya later.